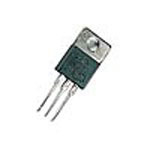 NPN driver transistor as used for many solenoid, flashlamp, flipper devices. Can be used in older games with lower coil voltages (25-50vdc) and in newer games with 42-80vdc coil circuits. Max. ratings: 100vdc, 5 amps. Direct replacement for 2N6532. Replaces Bally/Williams # 5162-09410-00.